We only have 7 spots available for this retreat so sign up quickly. The first 7 people to contact us will be in the retreat. All others will go on a waiting list. If we have a long waiting list, we will repeat the retreat in July & August. To sign up - go to the contact page of this website and send us your name, address, telephone, email and state that you want to be included in the June retreat. We will then contact you to let you know if you are in this retreat. Arrive on Sunday, June 23 at 4 pm. Leave on Thursday, June 27 at 11 am. Sunday Evening - supper, get acquainted, games & door prizes. 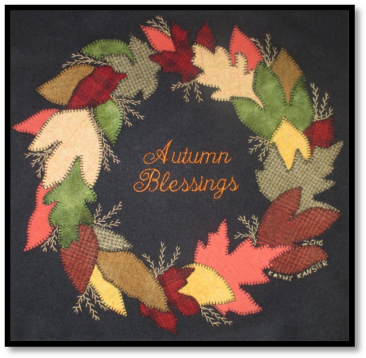 Monday Class - Autumn Blessings (kit with wool and perle cotton included). 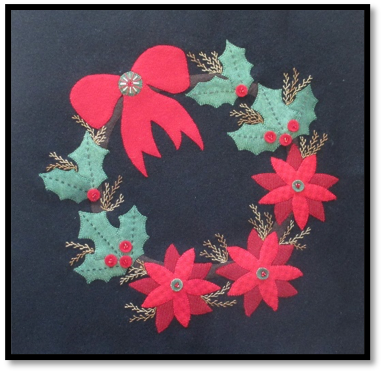 Tuesday Class - Christmas Blessings (kit with wool & perle cotton included). See more information about these wool projects on the teaching page under three hour workshops. Evenings & Wednesday morning - hand sewing on your projects. Wednesday afternoon - Go to Branson for shopping, dinner & a show. Note: these are at your own expense. All meals except for Wednesday evening are included in the retreat price. All twin beds, linens & towels (2 rooms with 2 people, 1 room with 3 people). Photos & more information about our retreat house are on the Retreat House page of this website. Non-refundable half down due by May 1; final payment due on June 15. Copyright ©2019 Kathy Kansier. All Rights Reserved.